There are numerous hotels and motels available to meet your lodging needs while you are attending a graduation at Fort Jackson. The nearest hotels are located in Columbia, South Carolina. 2019 Rebate at Hotels.com For our visitors with this link: Hotels.com: Save big NOW on all hotel bookings with Up to a $100 Cash Back Rebate with code REBATES19! Book by 12/31/19, Travel by 3/31/20. This Columbia, SC hotel offers full-service amenities and features, including free Comfort Sunshine® Breakfast, free weekday newspaper, free local calls and free coffee. Guests will enjoy working out in the exercise room and relaxing in the year-round indoor heated pool and hot tub. All spacious guest rooms come equipped with microwaves, refrigerators, coffee makers, hair dryer, irons, ironing boards, 37-inch flat panel televisions with cable and HBO. Handicap accessible and non-smoking rooms are available. Motel 6 Columbia East off Interstate 20 within 10 miles of Ft Jackson, home of Woodrow Wilson, South Carolina State Capital and Governors Mansion. Wi-Fi is available in all guest rooms for a nominal fee or enjoy our outdoor pool open May-September. Southern hospitality in harmony with nature. Welcome to the Hampton Inn Columbia-Northeast (Two Notch Road). The Hampton Inn hotel in Columbia-Northeast (Two Notch Road) is conveniently located in Northern Columbia, SC between I-77, I-20 and Highway 277, about a mile from the Columbia Mall and only five minutes from Fort Jackson. We offer a full range of services and amenities at our hotel to make your stay with us exceptional. With charming décor and convenient amenities, the Country Inn & Suites hotel is the ideal choice for graduation guests of Fort Jackson. Start your morning with our Columbia, SC hotel's deluxe "Be Our Guest" Breakfast buffet. The free breakfast features a rotating menu of hot items and a variety of other delicious morning favorites, including muffins, bagels, fresh fruit, hot and cold cereals, tea, juice and coffee. 100% Non-Smoking hotel. Hotel amentities include high-speed internet, indoor pool, fitness center, and suites. Columbia hotel is surrounded by businesses and attractions. 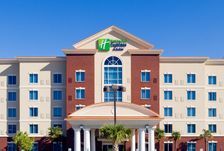 The Holiday Inn Express Hotel and Suites of Columbia-Fort Jackson, located 14 miles from Columbia Metropolitan Airport (CAE) and 5 miles from the CLB Amtrak Station, puts you only minutes away from the major business and culture districts of Columbia, SC. This Columbia hotel shows you true southern hospitality by offering amenities such as a 24-hour convenience store and an indoor, heated pool and whirlpool. You'll enjoy a complimentary hot breakfast bar and a 100% non-smoking hotel room when you stay at the Columbia, SC Holiday Inn Express hotel. 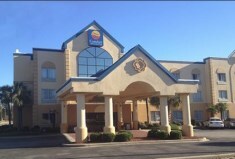 La Quinta Inn MainGate Fort Jackson is located in Columbia and local attractions include Fort Jackson, University of South Carolina, and State House. Additional area points of interest include South Carolina State Fairgrounds. Hotel Features. Recreational amenities include a fitness facility. Complimentary wireless Internet access is available in public areas. The hotel serves a complimentary continental breakfast. Guest parking is complimentary. Additional property amenities include laundry facilities. This is a smoke free property. Wireless Internet access is complimentary. Televisions have cable channels. Rooms also include irons/ironing boards and clock radios. Housekeeping is available daily. Guestrooms are all non smoking. 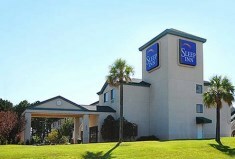 Conveniently located with easy access to Interstate 77, the Sleep Inn is only one mile from Fort Jackson. In addition to standard amenities, all spacious guest rooms include refrigerators, microwaves, coffee makers, hair dryers, irons, ironing boards and 32-inch flat panel LCD televisions. Handicap accessible and non-smoking rooms are also available. Stay at the Sleep Inn Near Ft. Jackson and enjoy our warm southern hospitality in a clean, relaxed setting when visiting the Columbia, South Carolina area. We look forward to seeing you soon. The Fairfield Inn & Suites by Marriott® hotel is perfect for families attending graduation. Just 5 minutes from Ft. Jackson. Enjoy nearby Riverbanks, Zoo, and Lake Murray. Consider yourself at home at the Candlewood Suites, Columbia/Ft. Jackson. This Columbia hotel is located in the heart of the city s metropolitan area, near the intersection of I-77 and Garners Ferry. Our hotel is close to the Columbia Metropolitan Airport, Ft. Jackson and McEntire Air Base. Our location couldn't be better, but what will really impress you is our spacious all-suite accommodations. Prepare and enjoy a home-cooked meal whenever you like in your fully-equipped kitchen. Choose a movie from our free library, and kick back in your over-stuffed recliner. Take advantage of free high-speed Internet access. Take a refreshing dip in the outdoor pool to cool off. 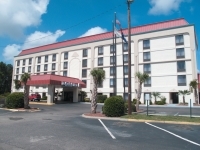 The Econo Lodge Fort Jackson is ideally located at Gate 1 to Fort Jackson. All rooms are air conditioned, and come equipped with refrigerators, microwaves, irons, ironing boards and cable television. Some rooms contain coffee makers and desks. Select rooms are designated non-smoking and handicap accessible. The Quality Inn Fort Jackson is conveniently located with easy access to Interstate 77, just three miles from Fort Jackson. Free deluxe continental breakfast, Free weekday newspaper, Free local calls, Free coffee, and Free wireless high-speed Internet access. Feel free to get a workout in the exercise room and take a dip in the seasonal outdoor pool. The Quality Inn & Suites Ft. Jackson Maingate is conveniently located near Interstate 77, providing easy access to Fort Jackson. Free deluxe continental breakfast, Free coffee, Free wireless high-speed Internet access, and Free local calls. Welcome to Days Inn Columbia — NE Fort Jackson hotel, near Columbia Metropolitan Airport. Located off Interstate 20, minutes from Fort Jackson, our hotel in Columbia, South Carolina, is a great spot to reenergize for your fun-filled vacation. Greet the morning with a free Daybreak continental breakfast. We offer free Wi-Fi Internet access so you can catch up on email from your hotel room and time-saving conveniences like 24-hour front desk, guest laundry facilities and free newspaper to help you make the most of your time in Columbia. Enjoy a convenient stop on your Palmetto State trip at our Super 8 Columbia / Ft. Jackson Area hotel near Columbia Metropolitan Airport. Located off Interstate 77, our Columbia, SC, hotel is less than one mile from Fort Jackson and offers easy access to shopping and downtown. We provide handy amenities like free high-speed Internet, refrigerators and microwaves to help you make the most of your time on the road, and our SuperStart continental breakfast gets you ready for a busy day. DINING OPTIONS. Spice up your trip with bold flavors at San Jose Restaurante Mexicano, within walking distance of our Columbia, SC, hotel. Nearby Rosso Trattoria Italia features wood-fired pizza, pasta and classic entrees. Enjoy traditional Japanese dishes and fresh sushi at Sakura, less than one mile away. For fresh char-grilled seafood and steak cooked to perfection, head to Bonefish Grill, less than five minutes from our door. The Rodeway Inn and Suites of Columbia offers a great location to both business and leisure travelers alike. 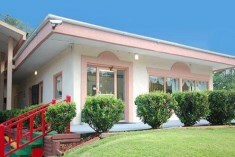 Free continental breakfast, Free wireless high-speed Internet access, and Free local calls. All of this coupled with our larger than industry standard guest rooms, and the hotel industries largest loyalty reward program Wyndham Rewards, together provide the impetus and confidence to offer our 100 percent satisfaction guarantee.